Most academic poets can be dropped into a few convenient categories. You’ve got your inscrutable scribblers who scratch out “experimental” work of obtuse meanings – political militants lecturing to folks who already agree with them – and the subsection of AWP folks whose very existence seems to be to publish each other’s work. George Bilgere falls into another category – the dangerously clever. Like Billy Collins, Jeffery McDaniel, Marge Piercy and Ted Kooser, Bilgere’s work is deceptively simple. The accessibility that is so often frowned upon by “serious” poetry instructors invites readers into Georges world of cafes where everyday observations take on archetypal importance. Most of the reading's fodder was plucked from Bilgere’s new collection The White Museum from Pittsburgh's Autumn House Press. George set up his pieces with fairly long introductions. These prologues though, didn’t take away from the works by over explaining but served well as a vehicle of background knowledge that helped the reader enjoy the forthcoming piece. This is a talent that is well appreciated by this listener when it is done well as it was here. Subject matter ranged from family – a mother who loved crossword puzzles, an aunt who introduced the poet to Europe, a father’s key ring – amusement parks, laundry chutes, and the ubiquitous appearance of cafes. I think this is where Bilgere is most comfortable and where his work shines – at a small round table with a strong cup of coffee surrounded by well read folks with nothing to prove. Like the sage fixture of a cafe who has become part of the ambiance, always good for an opinion or good hearted argument over art or baseball - Bilgere’s work (often making appearances on Garrison Keillor’s Writer’s Almanac) satisfies the way some desserts do. At first glance it seems a little small but with each bite one realizes the richness of the icing and the complexity of the flavors combine to leave one surprisingly sated – with a cup of coffee on the side of course. Canadian poet Christian Bök wants his work to live on after he’s gone. Like, billions of years after. He’s going to encode it directly into the DNA of the hardy bacteria Deinococcus radiodurans. If it works, his poem could outlast the human race. The sole way to avoid being swallowed up by the world is to render yourself indigestible. Of course by doing so you end up with a worse fate since when the earth refuses to swallow you, heaven must. A regular at the jazz spots on Scovill Avenue (Central/Woodland area) in the early 1940s, Jasper Wood was intimately familiar with the neighborhood's residents by the time he started taking their photographs in 1946. Click here to view Wood's extraordinary collection of photographs of this vanished neighborhood, including a rare photograph of noted American boogie-woogie pianist Arthur ‘Montana' Taylor, perhaps Scovill's most famous resident. The collection also includes images of West 25th Street and Ohio Amish Country. Wood's 1953 poetic film, Streetcar (viewable here: Part 1, Part 2), documents Cleveland streetcars just before service ended in 1954. Click here to read about Jasper Wood and the Scovill Avenue area. Click on any of the following subjects to browse other collections of images of Cleveland's Flats, Euclid Avenue, Edgewater Park, University Circle and the ClevelandFire Department. From the Cleveland Public Library Home Page. 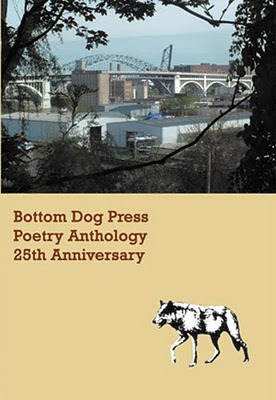 Mac's Backs Books and Bottom Dog Press invite you to a celebration of 25 year of independent publishing. The event will be held at Barking Spider Tavern in University Circle...5-7 pm...with pizza and poetry and music. Poets from the new Bottom Dog Press Poetry Anthology will read from their work...The book has a poem from each of its 91 books of publication. Poets who will be on hand include: Karen St. John-Vincent, Mary E. Weems, Ray McNiece, Meredith Holmes, Terry Hermsen, Marci Janas, David Shevin, Jennifer Burd, Michael Salinger, Maj Ragain, Rob Smith, Loren Weiss, Ken Meisel, editor Larry Smith...and Jim Lang reading for Daniel Thompson, and Michael McMahon reading for Russell Salamon. This is a major event. Join us. I've heard a few comments lately about "making it". It made me think about what exactly it is we're making when we "make it". And what it means to "make it". I think we most often hear this term applied to those in the arts--musicians, painters, writers, etc--in reference to being able to make a sustainable living at what they love. Becoming a household name, getting a song played on mainstream radio, making an appearance on Jeopardy!--whatever the specifics are, it usually means achieving a certain amount of fame and wealth. Maybe a modest amount, but certain amount nonetheless. But poets, well, we're a special breed, aren't we? Or at least, we like to paint ourselves as such. But few can argue that poetry is as mainstream an art form as pop music. Very few--if any--poets achieve the rock star status enjoyed by some of those in other creative fields. Very few are even able to make a modest living at poetry. So does that mean that fewer poets "make it", or is our definition of "making it" different for poetry? Yet, we can probably spot those who definitely HAVE "made it". We probably agree that a Billy Collins or a Maya Angelou have "made it". But can you "make it" without reaching quite that high a status? Say, someone who received a Pushcart nomination? And is it even important to "make it"? If you've spent any amount of time around poets in general, you've probably met at least one or two who don't believe in making money off of their art--maybe you're even someone who believes that yourself. Is there a way to "make it" in that case? Is "making it" even a goal? Do any of us ever expect to "make it" and work toward that goal, or is poetry just something we do for fun, community, socialization, release, art for art's sake? Let me know your thoughts on what "making it" means to you, whether you're a poet, novelist, graphic designer, musician, teacher, data entry analyst....I'm curious. Humor me. For those of you battling the insecurity monster, artist Karen Sandstrom has some choice words to tell it. (So, now I know what the insecurity monster looks like! Or, at least, what Karen Sandstrom's insecurity monster looks like. Say, isn't it good to know that it's really only six inches high? The Gay, Lesbian & Straight Alliance (GLASA) is a student group at Cleveland State University. On Saturday March 27th, GLASA will be hosting its second annual art show, Feed the Gays, to raise money for GLBT & Allied scholarships on campus (undergraduate, graduate law). 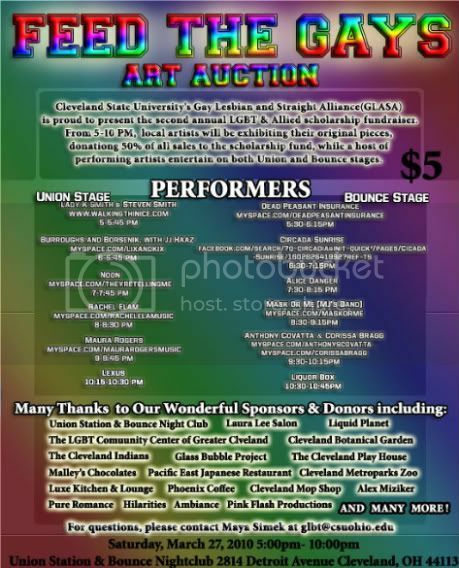 From 5pm to 10pm at Union Station and Bounce Nightclub (2814 Detroit Avenue in Cleveland), local artists will exhibit their work, donating 50% of all sales to the GLASA scholarship fund, while a host of performing artists entertain on the Union Station and Bounce stages. Among the scheduled performers: Cleveland poets Lady K & Steven B. Smith at 5 p.m., with Dianne Borsenik & John "Jesus Crisis" Burroughs (accompanied by 10-string guitar master JJ Haaz) at 6 p.m. The cost to get in is $5, with all proceeds donated to the scholarship fund. Native American poet and musician Joy Harjo will be at BGSU Firelands College Thursday March 25th...Come and hear her play and read her poems. She's a beautiful and engaged poet with a voice that speaks true. Free and open to the public...Firelands College is in Huron, Ohio...about 1 hour from downtown Cleveland...due West on Rte. 2...Then Rye Beach Road south half a mile. She'll be at the new Cedar Point Center on campus. Join us for an experience. 1. Consider these words: imagine, create, sustain. Stir well: create able, sustain image. Add ask, learn, try. Then heart, worth, good. 3. Ask, what’s real? The problem, limits, available energies? 4. Ask, what matters? What do we need? What is worth wanting? 5. Toss the rules. If you need them, they’ll show up again. 6. Wander. Dream. Mull. Unfocus. Take walks in places where you don’t have to pay attention—but where moments of attention reward you with surprise or pleasure. Collect insights, both blinding and fleeting. Let them grow. 7. Use your left brain. Then your right. Left. Right. Left, right. 8. Ask, what will feed my energy, mind, heart, imagination, play? 9. Assemble a team of doers. Talk, eat and drink together, have fun. -SueEllen Campbell, author of Bringing the Mountain Home. Any of these ring your bells? Well, if they do, Hawk and Handsaw opens for submissions on August 1. Get to it! :conjunction: :adjective: :preposition: :adjective: :plural noun:. and then fill in the blanks, focusing on a completely different topic than Stevens, but using his phrasing to create a new piece. The purpose of this prompt, of course, is to teach students to think in terms of phrasing, and to explore non-formal phrasings which clearly work and get them to ask why or how they work. Also, lessons like this teach the importance of word choice with in a phrase, line and poem. This sort of exercise can produce some very stunning poems; however, no matter how successful the new piece, there is still a dependence on the original poet and his or her line breaks, phrasing, etc. Has the second poet, then, stolen from the first in some way? Another example would be poets who take a line or stanza from another poet, and then create an entirely new piece based on that line. Sometimes the line is used as an epigraph, or the opening line, or imbedded in the poem itself in quotation marks and possibly a footnote acknowledging the original author. Sometimes, though, there is no acknowledgement at all. Has the second author, then, stolen something from the first? I am brought to the idea of jazz music, and things like covers and standards. These are tunes that are famous for the fact that their multiple versions and interpretations, no two alike. They are widely known by jazz musicians and enthusiasts, and need no acknowledgement beyond, perhaps, a liner note. No one in the jazz community, for example, eschews Miles Davis or Ella Fitzgerald for their versions of Thelonious Monk’s “Round Midnight,” but appreciate and celebrate the aspects which they brought to the piece. In the same way, as a poet who has lines taken for inspiration, I do not begrudge the poets who have used my lines for inspiration, but take the compliment and celebrate the new takes which those other poets bring to the words. On the other hand, as a poet who has taken lines and phrasings from other poets, I do not feel as though I am thieving from those other poets, but simply adding my take to their standards. To extend the metaphor, I am simply taking their basic chord progression or melody and adding my own nuances to it to create an entirely new piece. Either way, no crime has been committed. Vanity of vanities, saith the Preacher, vanity of vanities; all is vanity. What profit hath a man of all his labor which he taketh under the sun? One generation passeth away, and another generation cometh: but the earth abideth for ever. The sun also ariseth, and the sun goeth down, and hasteth to his place where he arose. The wind goeth toward the south, and turneth about unto the north; it whirleth about continually, and the wind returneth again according to his circuits. All the rivers run into the sea; yet the sea is not full: unto the place from whence the rivers come, thither they return again. All things are full of labor; man cannot utter it: the eye is not satisfied with seeing, nor the ear filled with hearing. The thing that hath been, it is that which shall be; and that which is done is that which shall be done: and there is no new thing under the sun. Is there any thing whereof it may be said, See, this is new? it hath been already of old time, which was before us. There is no remembrance of former things; neither shall there be any remembrance of things that are to come with those that shall come after. done: and but the earth abideth forever. this is new? It hath where he arose. Ignoring the weak line breaks and lack of craft in this piece for the sake of example, have I stolen something? While the KJV is not a copyright text, what if, instead, I took a paragraph from Seth Grahame-Smith’s “Abraham Lincoln: Vampire Hunter” and did the same thing? Have I created a new poem or have I committed a plagiaristic crime? Found poems are even more tricky. In a found poem, the poet simply lifts entire words, phrases and sections from another text (usually not a poem), then frames them as poetry using minor word changes and line breaks. A great example of this is Hart Seeley’s “The Poetry of Donald Rumsfeld,” which takes exact sentences, word for word, from Rumsfeld’s speeches and presents them with line breaks as poetry. Has Seeley stolen from Rumsfeld? What if, instead of political speeches, Seeley had chosen a literary text under copyright? Would the inserted line breaks be enough to create a new work? I am encouraged by Eliot Khalil Wilson’s thoughts that one does not own language, but I’m also trepidacious when it comes to submitting the successful results of more experimental forms like cut-ups and found poems for publication. As a poet, I don’t make enough money to get sued, but do feel that I have created new texts based on current works that, thought they maintain some allegiance to the original text, are unique enough to stand on their own. I’m curious to know where others stand on these sorts of issues or if anyone even thinks about them at all.